Some of the probems associated with joints are treated consevatively, but some conditions needs to be treated surgically. Both open surgery or minimal invasive surgery can the used for the treatment. However, minimal invasive surgery is trending among the doctors as it gives faster recovery period for the patients. 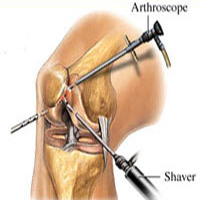 Arthroscopy is minimally invasive surgical method, practised now-a-days very successfully. Most of the surgeons prefer this kind of surgical method in most of the patients. Arthroscopy is also a diagnostic method to detect problems in the internal regions of the joints.This procedure is carried out with the help of a tiny camera called the arthroscope which enables the visualisation of the internal regions ,as it is connected to a monitor or screen. This procedure is also known as button- hole surgery or key-hole surgery. In arthroscopic surgeries unlike open surgery, the scars are very small and thus the recovery is also fast. The surgery can be performed as an out-patient case. Therefore the cost of hospitalization can be cut down. The surgery usually takes only one to two hours of time , so there are less requirement of care takers with the patient. The surgery as it provides faster recovery , the method has also became popular among the patients and also among the athelets. The complication associated with the surgery is negligible as compared to traditional open surgery methods.There are less chance of blood loss and other surgery associated risks, though risks with any surgery are common.Since the wound after the surgery is very small the risk of infection at the site of operation is minimal.The patients experience less pain following the surgery and healing of the wound is faster. Arthroscopic surgery can be used for the treatment of any joint related issues such as knee joints, hip joints, shoulder, ankle , elbow and wrist joints.After the knee arthroscopy ,one can expect a relief from chronic pain of knee joints. The knees can experience a natural motion. One can carry out their routine activities like walking with much ease. Hip arthroscopy is helps in the recovery from various hip conditions also such as Femoral acetabular impingement (FAI) and associated labral tears and cartilage abnormalities. 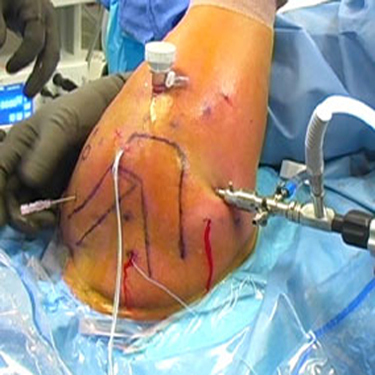 Elbow arthroscopy is also commonly used in the treatment of conditions such as the loose bodies and bone spurs in the elbow joint, osteochondritis dissecans and tennis elbow. Though arthroscopic treatment of tennis elbow are only performed by certain doctors. Shoulder arthroscopy has the advantage of recovery from shoulder conditions also such as rotator cuff tear, impingement syndrome, frozen shoulder and shoulder instability which gives chronic pain to the shoulders when moving the shoulders or doing activities involving shoulder movement and also sleeping by a side. All these shoulder conditions can be overcome by the minimally invasive surgery. Similarly, ankle arthroscopy can treat ankle conditions such as impingement syndrome or athlete’s ankle or footballer’s ankle and ankle instability. Athletes are most benefited by this arthroscopic surgery as they can return to their active sport within less time as the recovery following the arthroscopic surgery is faster. 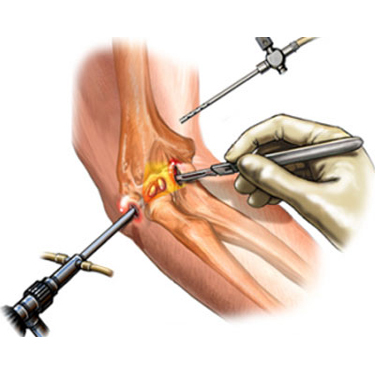 Arthroscopy is a process in which, problems in the internal regions of the joints are diagnosed and treated.This procedure is carried out with the help of a tiny camera called the arthroscope which enables the visualisation of the internal regions ,as it is connected to a monitor or screen. This procedure is also known as button-hole surgery or key-hole surgery. This is minimally invasive surgical method, practised now-a-days very successfully. Most of the surgeons prefer this kind of surgical method in most of the patients. Arthroscopic surgery can be used for the treatment of any joint related issues such as knee joints, hip joints, shoulder, ankle , elbow and wrist joints. Knee arthroscopy is considered when there are problems related to knee such as torn or damaged cartilages , knee cap displacement and inflamed synovium lining of the knee joint. Other knee conditions include the ACL or PCL tears. Hip arthroscopy is currently used in the treatment of hip conditions such as Femoral acetabular impingement (FAI) and associated labral tears and cartilage abnormalities. Shoulder arthroscopy is being used in the treatment of shoulder conditions also such as rotator cuff tear, impingement syndrome, frozen shoulder and shoulder instability. Ankle arthroscopy is currently used in the treatment of ankle conditions such as impingement syndrome and ankle instability. Elbow arthroscopy is used in the treatment of conditions such as the loose bodies and bone spurs in the elbow joint, osteochondritis dissecans and tennis elbow. Wrist arthroscopies are also carried out for problems associated with wrist. To diagnose the need for a arthroscopic surgery, a physician performs physical examination of the joints. The physician checks for the pain and range of motion of the joints. 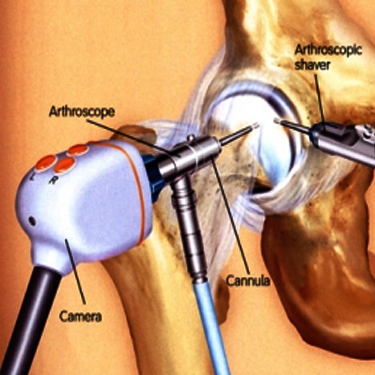 Arthroscope itself can be used to diagnose the damage in the joint.Other imaging techniques such as X-rays , CT Scans or the MRI of the joints are taken. During the procedure the surgeon makes a small incision on the affected joint , and inserts the arthroscope. The arthroscope, being connected to monitor enables the clear view of the damage that has caused to the joints. Depending on the severity of the damage , the surgeons decide whether to proceed further or not. If the surgeon decides to proceed , few more small incisions are made to insert the surgical instruments that are used to fix or remove the damaged tissues from the joints. The surgical instruments such as the manual cutters,rivets or anchors ,powered shavers, burrs or radiofrequency probes are inserted. With the help of shavers the surgeon cuts the torn cartilages and labrum, during hip arthroscopy . It also helps to remove the bump of bone which cause the wearing down of the labrum and cartilages. 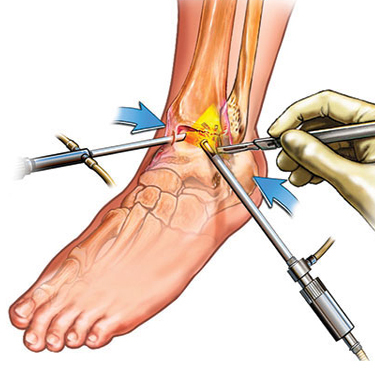 During ankle arthroscopy loose bodies and bone spurs are removed from the ankle joint.Once the procedure is completed the incisions are stitched together. The whole procedure is carried out under anesthesia. Local, regional, or general anesthesia can be given. Recovery process is usually fast in case of minor arthroscopy of the knee. The process does not require hospitalization, as the procedure only takes one to two hours of time. Recovery process is usually fast in case of minor arthroscopic surgeries. The process does not require hospitalization, as the procedure only takes one to two hours of time. Most of the patients leave the hospital the same day. Physical exercises are to be carried out as a part of the routine to restore the full range of joint movements and to achieve best results. However, good rest of the operated joints are advised. Some pain medications are prescribed by the doctors initially for few days, which help in pain management after surgery. There would be small incisions at the site of surgery, which would be dressed after the surgery.The wound dressing should be removed as per the guidelines of the doctor. The wound should be kept dry for the initial few days.The patients with arthroscopic surgery of the knee and ankle are advised to keep the leg in the elevated position for few days to prevent swelling. Lifting weight bearing articles or putting stress on the operated joints are prohibited for few days. Regular follow -ups with the doctor is required as suggested by the doctor. Patients are not allowed to get back to school or work for few weeks. After the knee arthroscopy, one can expect a relief from chronic pain of knee joints. Full recovery following the knee arthroscopy depends on the type of damage for which the surgery was performed. In some patients depending upon the damage, they might need to use crutches to facilitate walking. If the injury was severe, then the recovery would take a period of several months. The knees can experience a natural motion. One can carry out their routine activities like walking with much ease. For the first two weeks after the surgery, the patient requires crutches . After this period the patient is usualy made to carry out some physical exercises to improve flexibility of the hip joint. Total regain of the activities might require six to eight months. Most of the athletes and other active people are benefited with hip arthroscopy as they can return to their active sports life. The recovery period is usually estimated to be one to six months. For several weeks the patient requires a sling. With physical therapy and good care, total recovery is possible for most of the patients and they regain normal flexibility of the shoulder. The recovery period is usually estimated to be two weeks. Howeer the patient can start waliking with one to two days after the surgery. With physical therapy and good care, total recovery is possible for most of the patients and they regain normal flexibility of the ankle. Most patients return to their usually activity within two weeks with the help of physiotherapy. However activities involving lifting heavy things are prohibited until full recovery. Full recovery from loose body removal takes around 2-3 weeks and bone spur removal takes little longer period of 8-12 weeks.